It is not easy at school for Marcel. As a green sheep, he is often isolated and confronted with prejudices. But his family gives him support. 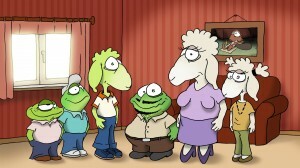 In short interview sequences, the film describes the everyday life of the patchwork family El Sapo and reports on the difficulties of a partnership between frogs and sheeps. Carsten Strauch , born in 1971, studied Visual Communication at the Academy of Art & Design Offenbach from 1992-2001. His films include the shorts Futter, winner of the German Short Film Award in 1997, and The Pocket Organ (Das Taschenorgan, 2000). In 2007, he directed his feature debut Die Aufschneider.